Isn't this one of the most elegant cards you've ever seen? It's beautiful!! My wonderful friend, Leilani, made this and gave it to me!! 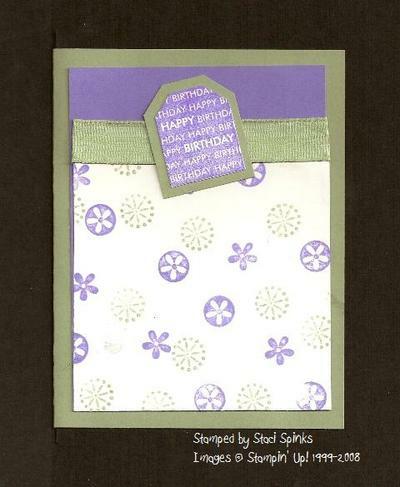 The cardstock is the new Basic Grey--a very nice color! It's highlighted with the Blue Bayou flowers! 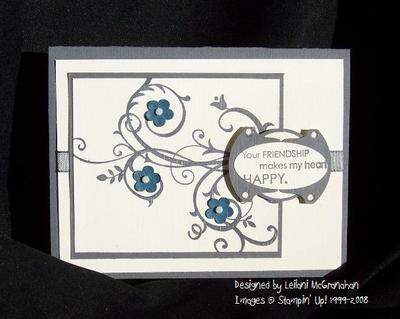 And look at the sentiment--what a cool use of punches!! P.S. 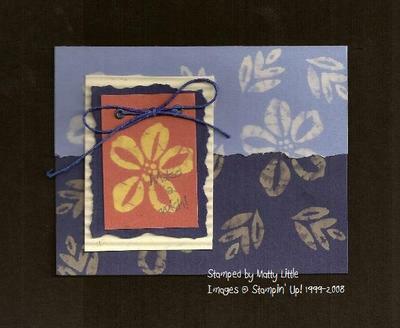 Leilani just emailed me, and wanted me to let everyone know that she didn't actually design the card--it was CASE'd! She didnt' want to take credit for it!!! I don't have a single thing to share with you today! But, I did manage to upload a swap I participated in! All the cards use the Sale-a-bration sets!! Just scroll down, and you'll see the Sale-a-bration photo album on the right!! Oh my goodness, will you look at this beautiful card?!!! I received this card from Rose for my birthday. She used the cracked glass technique for the main image. It is really stunning!!! I love the scalloped oval!! Thanks so much Rose!!!! 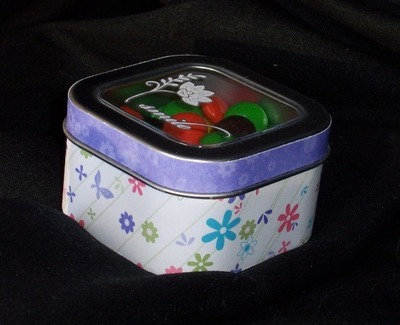 Here's another clear-topped tin! These are sooo much fun to make, and so easy!! 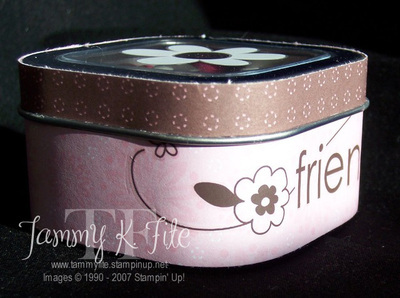 This time, I used the Eastern Elegance Rub-ons and the Flowers for You Designer Paper. I think it turned out cute!! Hi!! 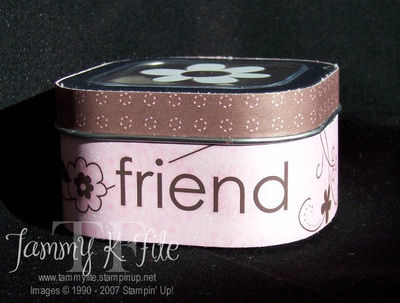 I recently held a special stamp camp for my downline, and this was one of the gifts I gave them!! 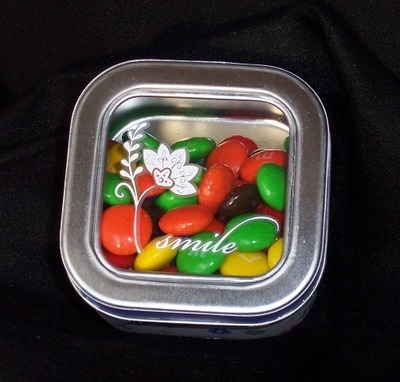 The tins were purchased at www.specialtybottle.com. 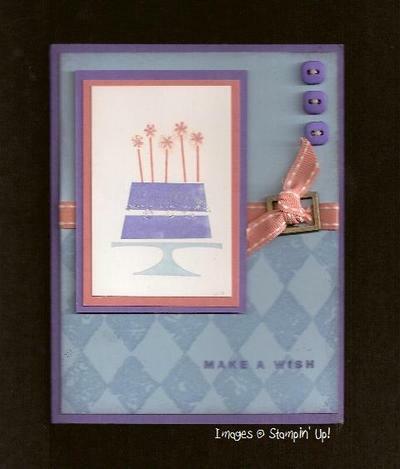 I used the Berry Bliss Designer paper, and adhered it using the sticky strip (LOVE this stuff!!). I then used the Love & Happiness Rubons from the Sale-a-bration catalog!! You can get these FREE with a $50 purchase! The package includes four sheets of rubons--they're fantastic!! I used the white sheet on the clear top, and the chocolate ones on the side. Also included is a sheet of black and a sheet of olive rubons. Contact me or your demonstrator to place your order today!!! Here is the card I made for my husband for Valentine's Day! I used Blue Bayou everything! And then added the run-ons! I love these--they are so simple to use!!! I have to get my kiddos up for school now--have a great day!! Good morning!!! Because Monday was a holiday, I had a chance to stamp!! woohoo!! Here's a card I made--it started out as a card for a sketch challenge, but when it was finished, there was no hint of the sketch!!! Oh well, I like it anyway!! I told you I had received alot of cards!! And, each one is awesome!! I love them all!! Love this set!! And, the bleaching looks so cool!! Thanks, Matty!!! This came from the divas at Utah Divas. Isn't it beautiful!!! There are alot of talented girls in this group--I'm honored to be a member! Thanks to all of you!! I used Lovely As a Tree, also. 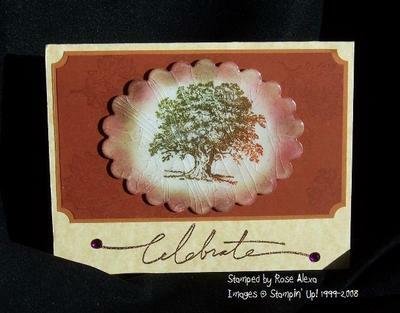 It's actually the only tree stamp I own, but I agree with Allison--it is one of the best sets of all time!! The card base is Mellow Moss, and then I layered Very Vanilla. 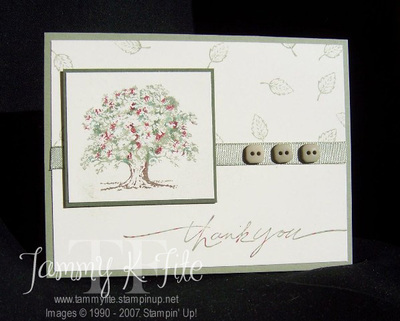 I stamped the small leaf randomly on the top half of the card. I used sticky strip to adhere my Mellow Moss taffeta ribbon, then mini glue dots to put the buttons on. The tree--I inked it with Mellow Moss ink, then I took markers and "thumped" on it randomly. Give it a good huff and stamp! Doesn't it give a cool effect?!! I did the same thing on the sentiment, but it's hard to see in the picture. Thanks, Allison, for a fun challenge!!! Another card for my birthday!!! This was made by one of my very best friends! Thanks so much, Staci!! P.S. The boys love the singing monkey!! !